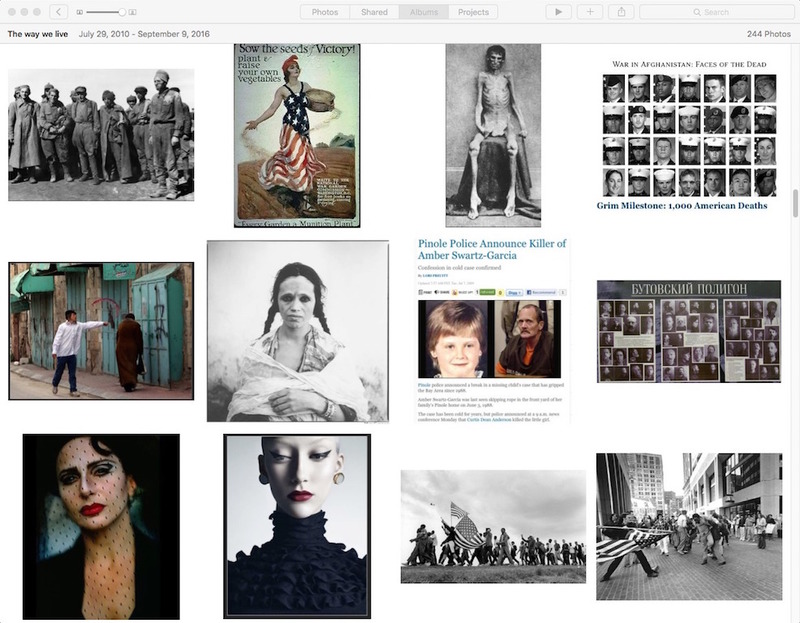 Renaissance pictorial conventions are not necessarily the most effective for creating symbolic images. “St. 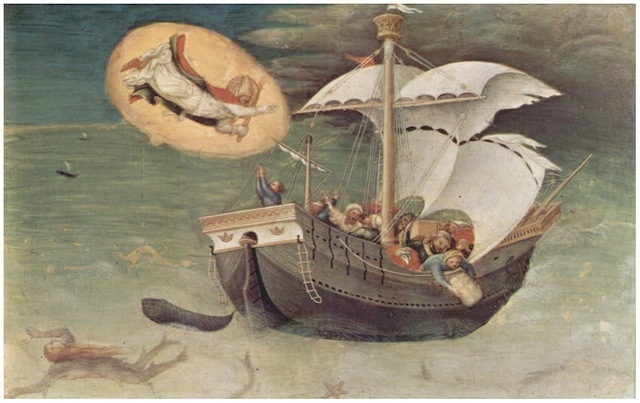 Nicholas of Bari” by Gentile da Fabriano ( 1370-1427– i.e., pre-Renaissance) is a wildly irrational piece in its formal logic (floating as if in mist rather than water, the ladder and skiff in scale with the ship but the crew oversize, the flying saint, etc.) but entirely convincing as an illustration of miraculous intervention. One demonstration of its effectiveness is that even without a label we would know more or less what it’s about. 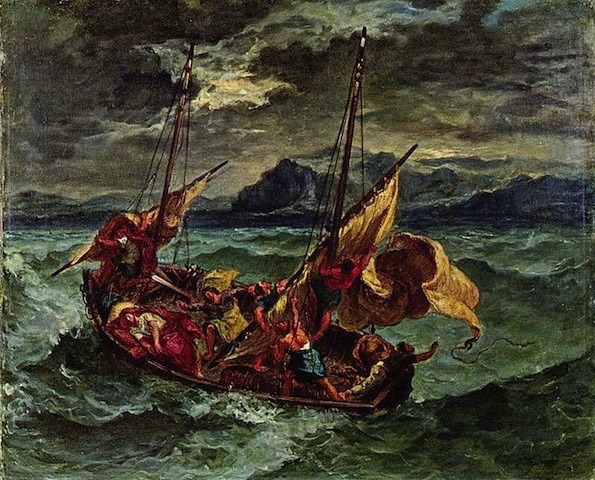 Whereas even with the retro costumes, Eugene Delacroix’s lively piece might be any storm-tossed boat if we weren’t informed of the subject. The spectacular details of sea and sky and lashing sails are what engages him. Very French Romantic, but thin on miracles. 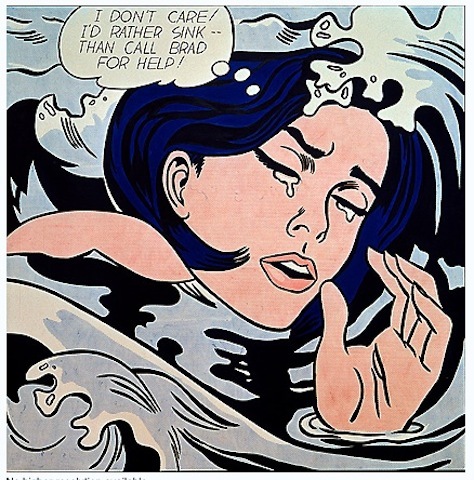 Which brings us, perhaps a little abruptly, to “Drowning Girl” by Roy Lichtenstein. 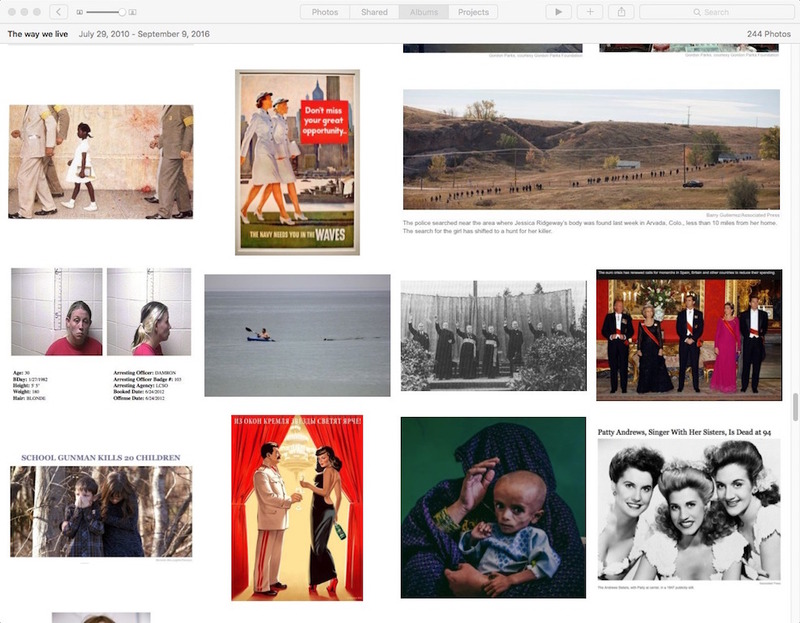 It illustrates a symbolic rather than an actual moment. Even without the text we would have a pretty good idea of what it’s about. In its knowing disregard of pictorial literalism, it circles most of the way back to Fabriano–closer to him than to Delacroix. Some works of art are delightful even if they are less than great. This piece by Tamara de Lempicka (1898 – 1980), “Girl with Gloves” (1930) is one such. 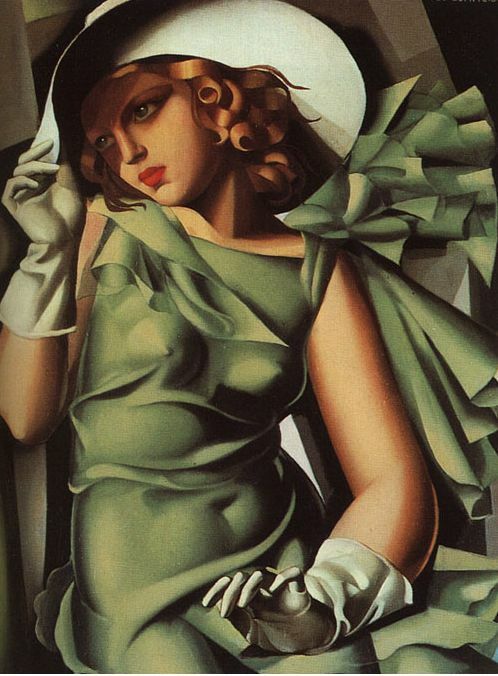 Lempicka’s work is all about style, and in her dedication to decorative boldness she is no slave to visual logic. Consider the shadows that create the texture of this piece. The forms slip from bright light to intense dark very quickly–as in the girl’s torso, where a narrow range of light tones model the figure, and then plunge into improbable darkness. Or that square neck. But shadows only happen when convenient. Her right arm, for example, casts no shadow across her torso, her torso casts no shadow across her left arm, and the shadow of her hat across her left shoulder stops there, without reaching the flurry of ruffles behind her. And to keep the figure from vanishing into the background there are adroit if logically inexplicable halos on her left elbow, left breast, right arm, and right hip. 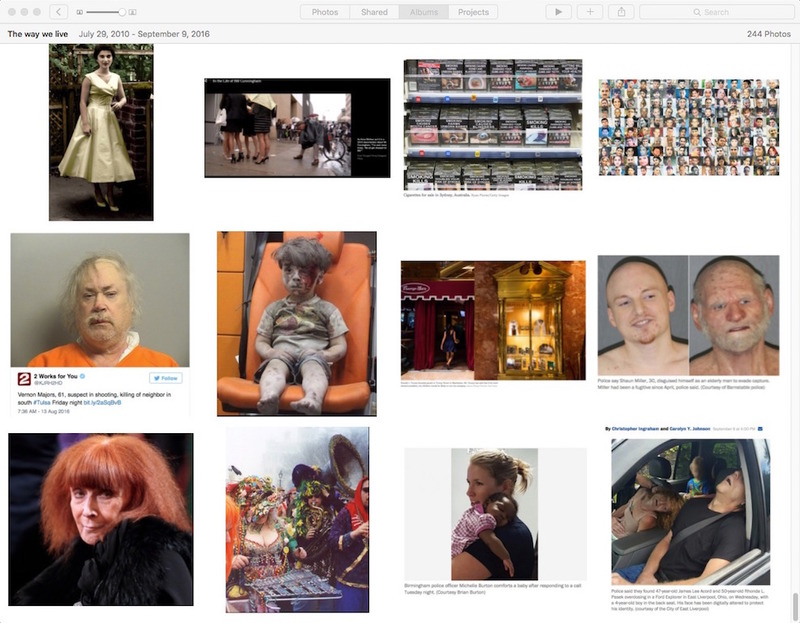 There are some infelicities. The left arm is oddly heavier than the right. The right breast is half the size of the left one, and several inches out of place. But never mind. There is much to admire. The modeling in the girl’s face and hair have more gentle middle tones than elsewhere, and the shadows more light and warmer color. Again, this is inconsistent, but why quibble? Logic is not the point. The pleasure here is in the happy tumult of ingenious shapes. 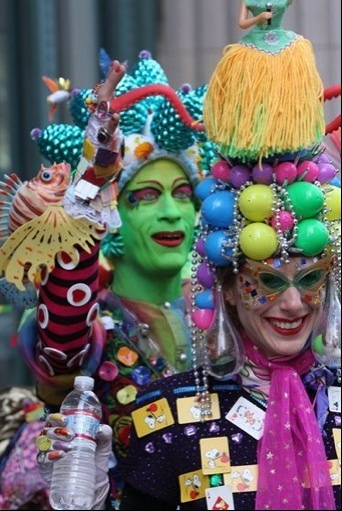 This post is a reprise of February 4, 2012. 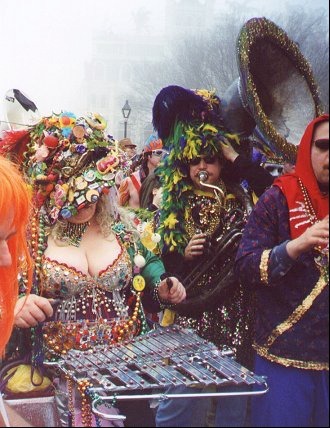 If you’ve had occasion to look up “glockenspiel” in Wikipedia you won’t have missed this delicious photo of the instrument at Mardi Gras. 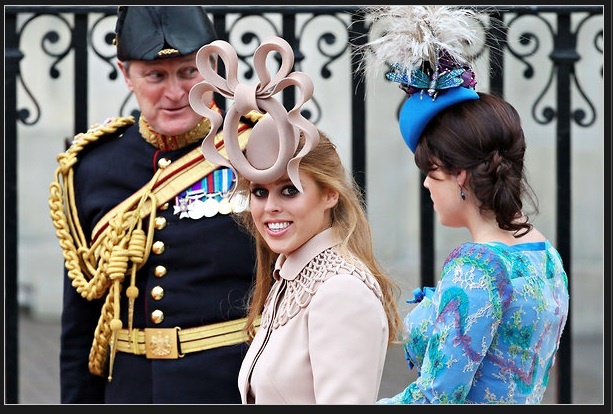 You’d have to go back to The Wedding or the Gay Pride Parade to find anything quite up to it.